A re-analysis of a 50,000 year old Neanderthal skull shows that, in addition to enduring multiple injuries and debilitations, this male individual was also profoundly deaf. Yet he lived well into his 40s, which is quite old by Paleolithic standards. It’s an achievement that could have only been possible with the help of others, according to new research. When the remains of this older Neanderthal were discovered at Shanidar Cave in Iraqi Kurdistan in 1957, his many physical injuries and disabilities were immediately apparent. Analysis of his skull showed that he suffered a crushing blow to the head near his eye socket when he was young, likely causing some visual impairment. His right hand and forearm were missing, the result of an amputation. He likely walked with a serious gait, and he suffered from hyperostotic disease (DISH), which is associated with muscular pain and reduced mobility along the spine. But a new analysis of this specimen, known as Shanidar 1, shows he had another major disability—one not noticed during earlier examinations. New research published in PLOS One reveals that the bony growths found in this Neanderthal’s ear canals would have resulted in serious hearing loss. So this Paleolithic-era hunter-gatherer, according to the updated analysis conducted by anthropologists Erik Trinkaus from Washington University in St. Louis and Sébastien Villotte of the French National Centre for Scientific Research, was profoundly deaf. Yet despite his deafness and his other physical setbacks, Shanidar 1 died between 40 and 50 years of age (based on dental analysis). By Paleolithic standards, he was an old man. The only way he could have lived to such a ripe old age is by receiving considerable help from others. “More than his loss of a forearm, bad limp and other injuries, his deafness would have made him easy prey for the ubiquitous carnivores in his environment and dependent on other members of his social group for survival,” said Trinkaus in a statement. His inability to hear would have resulted in reduced communication and diminished social activities requiring coordination, thus making him less effective as a hunter and a forager. It would have been difficult for Shanidar 1 to learn how to fashion tools and use them, and as noted, he would have been more vulnerable to medium and large carnivores (e.g. wolves, large cats, bears). Trinkaus and Villotte says it’s not surprising that his fellow Neanderthals were able and willing to provide this level of social support. Profoundly, these extinct humans buried their dead, a funeral act that anthropologists say is indicative of social cohesion, social roles, and mutual support. What’s more, Neanderthals used pigments and feathers to modify their appearance, which the authors say is “a reflection of social identity manipulation and social cohesion.” To say Neanderthals cared for the physically impaired is therefore not a stretch. Importantly, other examples of prehistoric social support exists in the scientific literature. A study from 2014 revealed a Neanderthal from Spain who suffered from similar hearing loss, and the remains of a five-year-old archaic human with a severe brain deformity who wasn’t rejected at birth. 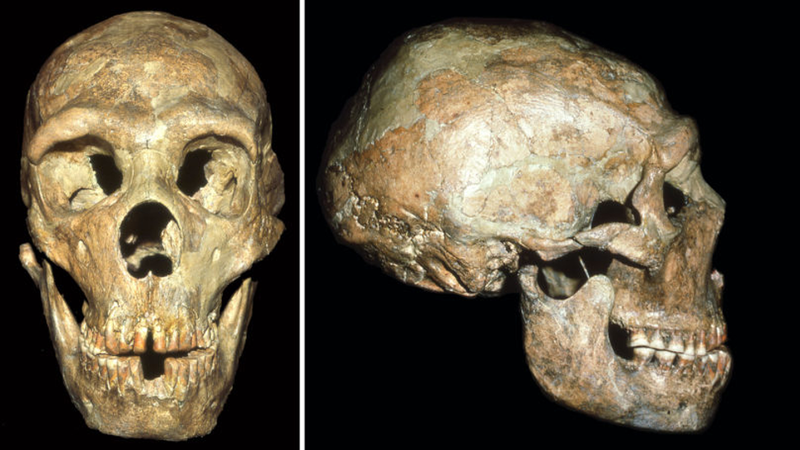 Our conceptions of Neanderthals, as this new study shows, has now moved well beyond the outdated notion that they were brutish proto-humans who cowered in caves. As we’re learning, the behavioral differences between Neanderthals and modern humans are, in the words of the researchers, “modest” at best.